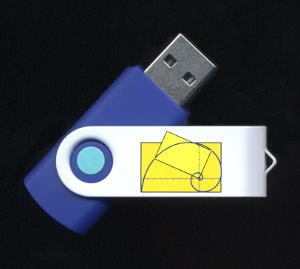 The Home Study Companion: Algebra 1 lessons, distributed on an 8GB reusable flash drive, are based on Paul A. Foerster’s Algebra 1: Expressions, Equations, and Applications. This textbook is available as part of Pearson’s Prentice Hall’s Classics series, or in older editions through various used book sources. The text is a true classic! All of my courses are now being distributed on 8-GB flash drives, which enables me to make more frequent updates than with DVD ROMS. Paul A. Foerster has taught mathematics at Alamo Heights High School in San Antonio, Texas since 1961. In that same year he received his teaching certificate from Texas A&M University. His B.S. degree in Chemical Engineering and M.A. degree in Mathematics are from the University of Texas. Among many honors, he was awarded the Presidential Award for Excellence in Mathematics Teaching in 1983. He brings to his teaching and textbook writing the insights from his engineering background. His textbooks contain some of the best collections of real-world applications to be found in any algebra textbook. The lessons in this course are based on “screen-capture video” technology. To the user they appear as “whiteboard lectures” (see screenshot below). They provide the missing “classroom presentation” part of the course for anyone studying mathematics at home. You will need to separately purchase a copy of Foerster’s Algebra I: Expressions, Equations, and Applications. The flash drive contains a second video for each section showing worked-out solutions for the suggested assignment list, about half of the problems in the text, usually all of the even problems. The video solutions can be used to check the work and to help get over any hurdles in solving the problems. If more problems are desired for extra practice, the odd problems have answers in the back of the book. 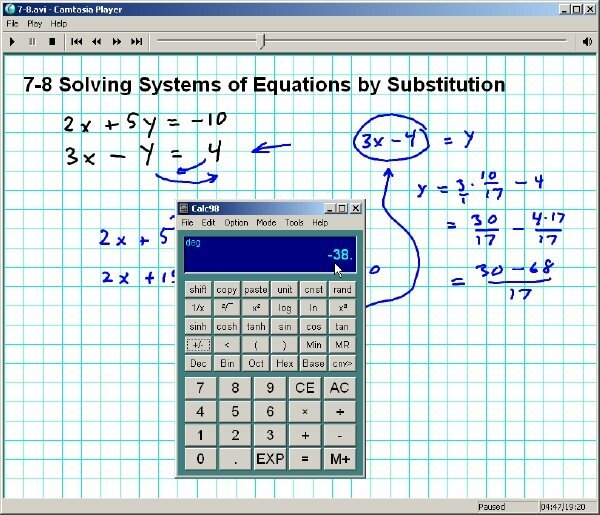 A solution manual is available from Pearson-Prentice Hall (also from RainbowResource.com), but you will probably not need the solution manual for this course since a video solution guide for the assigned problems is included. (The printed solution manual has worked-out solutions to all problems in the text.) Texts may be obtained directly from Pearson-Prentice Hall, through their Oasis program, RainbowResource.com, and through various new and used textbook sources such as Amazon.com, Valore Books, etc. A number of parents have asked how to pace of the class over the course of a school year. In a home schooling environment the schedule can, and probably should, be more flexible than in a standard classroom. The ultimate basis for setting the pace is the level of understanding of the student. Keep in mind that some schools offer Algebra 1 as either a 1-year or a 2-year course, depending on the ability and readiness of the student. Mathematics textbooks are generally structured on the assumption of covering one section per day, with extra days for testing, review, and re-teaching of the more difficult topics. If you cover it over two years you could, of course, double the time spent per section, but you might find some sections go quickly, and more time could be allocated for review. The table below should help. I highly recommend that parents be closely involved with the students’ progress. The surest way to get behind is to allow the student to “slip through” the material without demonstrating that they understand it thoroughly. When this happens early in the course, you will find them unprepared for the work later in the course or in later courses. If they display difficulty in basic arithmetic along the way, set aside a block of time for arithmetic review. For testing, you could pick a selection of easier and harder problems from each section of the chapter. (See my essay on assessment and grading published in Homeschool Magazine.) The student should keep a notebook for all homework and you should always insist that all the work be shown on the same page as the answers. If your students say they can do the problems in their head, ask them to show you on paper what is going on in their head. If they insist that it is a one-step mental problem, have them explain their reasoning to you. I recommend treating this as a practical rather than a moral issue, although you will have to find your own balance on that question. If you, as a parent, are rusty on Algebra, or perhaps never took it or never understood it the first time around, the ideal situation would be for you to take this as an opportunity to go back and be a student along with your child. (I recognize that real life tends to get in the way of the ideal situation.) Adults typically approach learning with more maturity than a child. You can be a role model of the learning process, even if it comes hard for you. If your child has to explain things to you, all the better. A little humility is good for the soul, and having to figure things out together will deepen the understanding for both of you.